Two thirds of respondents in our latest Underground Knowledge group poll in Goodreads.com believe whistleblowers Edward Snowden, Julian Assange & Bradley Manning are heroes, not traitors. 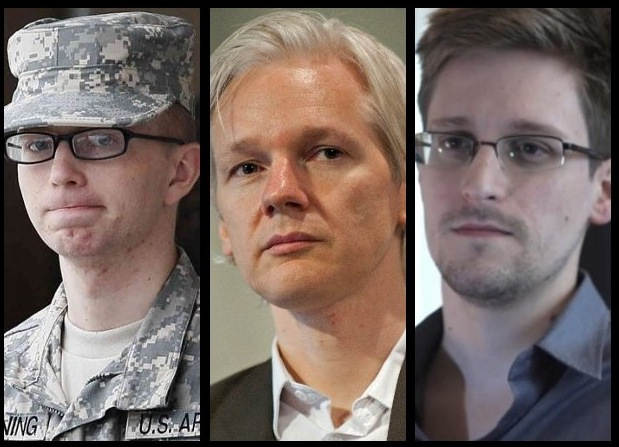 Whistleblowers Manning, Assange and Snowden…heroes or traitors? In response to the question What is your opinion of whistleblowers like Edward Snowden, Julian Assange & Bradley Manning who leak classified intelligence information to the public concerning their own government’s criminal activities? 67% say they’re heroes; only 7% believe they’re traitors; some 21% say they’re a mixture of heroes and traitors; and 5% are undecided. (Interim results). 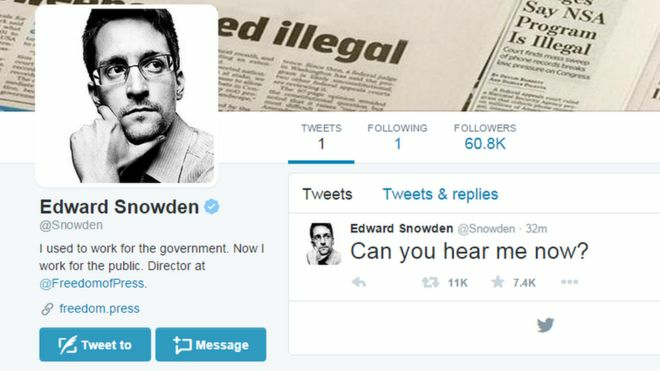 Speak of the devil, Edward Snowden joined Twitter today: https://twitter.com/Snowden or @Snowden In less that 24 hrs he had 1,000,000 followers. While Snowden himself only follows 1 Twitter account: the NSA! Count me as one of those followers (of @Snowden). I told him I think he is a hero. Now to wait for the armed, jackbooted whom ever to kick in my door and take me away. Snowden’s latest tweet was pretty funny: “Meanwhile, a thousand people at Fort Meade just opened Twitter.” So he’s implying 1,000 NSA employees immediately joined twitter simply to monitor his tweets. Ha! These guys did not go to the Inspector General, they dumped everything into the public sector, and one ran straight to the most dangerous enemy civilization still has: Putin. If Snowden had pumped & dumped and stayed in Waikiki, or flown directly to LA or NYC then it would have been poorly executed whistleblowing. By taking the trash directly to enemies of the State, and frankly enemies to civilization itself, they became traitors. Plain and simple. … the real TRAITORS to the US Govt, the Cheney’s, Bush, and yes Obama, Rumsfeld, Clinton, McCain and others!! On every level of government, the People are responsible for keeping all laws Constitutional and for removing from office officials who commit acts against the law or the Constitution. We are each responsible and should give hero’s welcome to all whistle blowers. Snowden should still be shot for treason. Cheney should have something worse done to him: siezure of all his assets and those of his cronies under the Haliburton umbrella corporation for restitution to their victims worldwide. …And then prison for the rest of his miserable life. How Snowden and Manning chose to act was poorly at best, and completely against the good of this nation or the security of our citizens. Like the fact that they ‘raged against the machine’? Great, but the choices they made were clearly wrong, and their stated goals do not match the actions taken; traitorous. Fixating on minor misdemeanours of “whistleblowers-traitors” against a traitorous intelligence industry is like criticizing the jail warden who pulls the switch that kills mass murderers on death row. Key reason the mass public is by and large getting behind the likes of Snowden, Manning and Assange is that the public don’t give a flying f^#% about the military’s rules and regulations, because they know the Military Industrial Complex doesn’t give a flying f$^# about the public anymore. Freedom of speech philosophy appeals to ‘Undergrounders’ on Goodreads.com – Come visit us! Our freedom of speech philosophy and no-rules policy appeal to fellow Undergrounders (members of our Underground Knowledge discussion group on the international literary site Goodreads.com) if the group’s burgeoning membership is any guideline: membership has just topped 1200, making it one of the fastest growing groups of its kind – if not the fastest – on the popular Amazon-owned book site. Book the inspiration for our group. Some of the group’s discussion threads contain literally hundreds of posts by members – a reflection no doubt of the timely and often controversial topics covered in these threads. Examples of those topics are listed in earlier blogs. Also mighty popular are our ongoing polls. For example, our latest poll, which closes October 16 PDT, asks: What is your opinion of whistleblowers like Edward Snowden, Julian Assange & Bradley Manning who leak classified intelligence information to the public concerning their own government’s criminal activities? Whistleblowers Manning, Assange and Snowden. Do you believe World Trade Center 7 (aka Building 7), which no plane hit on 9/11, collapsed solely due to fires as per the official story? Do you believe genius-level intelligence is primarily the result of nature (genes) or nurture (education, environment, parenting etc)? Do you believe Jesus Christ was a real historical person? Do you believe Robert (Bobby) F. Kennedy (RFK) was solely killed by the “lone gunman” Sirhan Sirhan? Do you believe the likes of Bill Gates & Warren Buffett are the richest people in the world as per the annual Forbes Rich Lists? Do you believe classified mind control technologies are being used by governments on innocent citizens? Do you believe MARILYN MONROE committed SUICIDE or was MURDERED? Do you believe A.I. (artificial intelligence) will ever be more advanced/sophisticated than human intelligence? Do you believe time travel is possible? Do you believe the Pyramids of Giza were constructed solely to be burial chambers (tombs) for the pharaohs as Egyptologists tell us? Do you……and the list goes on… Check it out via the above link. 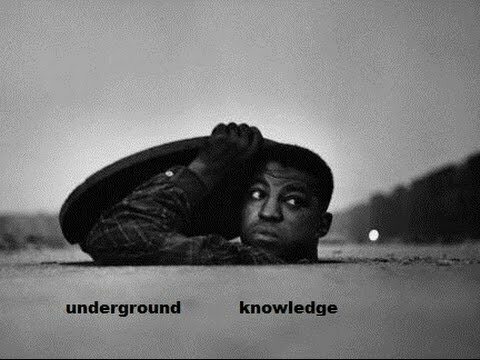 Members of our Underground Knowledge group include scientists, journalists, moms and dads, historians, doctors, whistleblowers, authors, bankers, teachers, intelligence personnel, housewives, students, Army vets, pacifists, conspiracy theorists, the odd redneck and the Average Joe. All viewpoints welcome! Snowden, Assange, Manning…traitors or heroes? Interim poll results in! In the latest poll in our ‘Underground Knowledge’ group on Goodreads.com, we ask members: What is your opinion of whistleblowers like Edward Snowden, Julian Assange and Bradley Manning who leak classified intelligence information to the public concerning their own government’s criminal activities? Interim results show that 68% of poll respondents consider the whistleblowers are heroes; only 10% consider them traitors; some 16% consider them a combination of both traitors and heroes; and 6% are undecided. They are both. On one hand they are heroes because they exposed governmental misconduct at personal risk. On the other they are traitors because as government employees they violated an oath and perhaps put some people at risk. What if the military personnel who man the nuclear weapons were given the same freedom to violate their duties? Snowden should be lauded and then put in prison. These people do the public and their countries a great service which puts themselves in jeopardy!…The three listed above are the ones that stand out most in peoples minds, BUT, there are many others including news reporters who “have accidents” Mike Hastings and Martin Burns being two i know of personally. The facts could have been shared with Congressmen who write the laws, and could have affected changes these men sought, without compromising the security of this nation or the safety of our people. The Americans are nothing less than traitors and should be shot. Assange has just been exploiting any exposed secrets, to the detriment of any and all nations or people involved. Is it right to rendition and torture people who are innocent, is it right to drone strike civilian targets, is it right to arm train and fund terrorism, is it right to ship major amounts of narcotics into the USA? NONE OF THAT IS RIGHT!!! Praise to those who expose it!! Yes, it is the duty of every serviceman or woman to report wrongdoings, and even disobey illegal orders. However, all of the activities divulged were legal under the authorities granted, or they were dealt with using the legal system. Reports must be made through the chain of command, or barring that to the Inspectors General. Neither of those options was chosen. Contractors hired for wetwork? Yes, very wrong, but not illegal during the Bush/Cheney administrations, because Cheney’s cronies were involved. I don’t think that’s correct, K……. At least some of Assange’s leaks exposed highly illegal activities, for example the footage of helicopter pilots shooting Iraqis for sport including civilians. There were numerous other similar leaks, I’m pretty sure. You can imprison one Manning or Assange, or kill another, but the spirit of whistleblowers is alive and well now and it’s the beginning of the end for the global elite. You cannot kill or imprison them all and what we are seeing so far is literally the first wave of whistleblowers from the military and CIA etc. Poll ends October 10, 2015. The Underground Knowledge discussion group is open to everyone! All you need is an enquiring mind, an interest in the world we live in and a desire to learn or to uncover “underground knowledge” on important issues of our times. This group is also for like-minded people to discuss the controversial topics explored in The Underground Knowledge Series, which includes the non-fiction books Genius Intelligence, Antigravity Propulsion, Medical Industrial Complex, The Catcher in the Rye Enigma and International Bankster$. Our members include scientists, journalists, moms and dads, historians, doctors, whistleblowers, authors, bankers, teachers, intelligence personnel, housewives, students, Army vets, pacifists, conspiracy theorists, the odd redneck and the Average Joe. All viewpoints welcome! We refer, of course, to Luke Harding’s The Snowden Files, which provides an eye-opening overview of whistleblower Edward Snowden’s running battle with the National Security Agency after leaking thousands of classified files to news organizations. 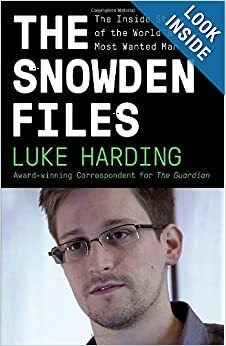 Book reviewer Greg Miller, national security correspondent for The Washington Post, reminds readers via his truthdig.com review of Feb.21 that author Luke Harding is the same LH who is a correspondent for The Guardian newspaper, which broke the initial Snowden story. …“The Snowden Files” won’t be the last book on this subject nor likely the best, with Gellman and Greenwald titles already in the works. But Harding has delivered a clearly written and captivating account of the Snowden leaks and their aftermath, succeeding beyond its most basic ambition, which was to arrive in bookstores first. 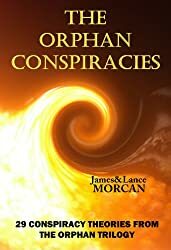 Many of the concerns Snowden has raised regarding America’s surveillance programs and its espionage methodologies are highlighted in our top rated conspiracy thriller series The Orphan Trilogy (The Ninth Orphan / The Orphan Factory / The Orphan Uprising). That’s not to say we necessarily sympathize with Snowden or approve of his actions, but we do sympathize with many of the ‘Big Brother’ concerns he and others like him have raised. 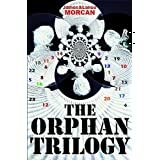 The Orphan Trilogy exposes a global agenda designed to keep the power in the hands of a select few. Our antagonists are a shadow government acting above and beyond the likes of the White House, the FBI, the Pentagon and the NSA… Sounds familiar? Merging fact with fiction, the trilogy illuminates shadow organizations rumored to actually exist. Our three novels explore a plethora of conspiracies involving real organizations like the CIA, MI6, and the UN, and public figures such as President Obama, Queen Elizabeth II as well as the Clinton, Marcos and Bush families.